EIGHT months since taking power, the government of Nicaraguan President Daniel Ortega is facing fierce opposition from reactionary sectors – both national and international – led by the United States, who are persisting in ignoring the structural changes that have been embarked on in this new era for national politics. It concerns an ideological struggle, radicalized in the last few months, between the principles and the program to improve the quality of life of the majority of the impoverished Nicaraguan population and, on the other hand, the interests of the right wing, who are witnessing a threat to their class privileges in the face of overwhelming support for the process being set in motion by Ortega and his cabinet. Ortega continues to condemn the destabilization plans on the part of the government in Washington, and in the last few weeks has attacked the Free Trade Agreement (FTA), signed by his country with the United States, contrasting the vast differences between that and the Bolivarian Alternative for the Americas (ALBA), which it has already signed along with Cuba, Bolivia and Venezuela – the main driving force behind the project – the philosophical base of which is fair trade aimed at improving the lives of the poorest sections of those countries. “Unfair trade” was one of the president’s descriptions of the FTAs, because they always benefit the largest country. He gave as one example the effects that will be felt by Nicaragua’s tobacco industry on account of the import and sales taxes applied to that product by the United States. By adopting this measure, thousands of Nicaraguan producers will lose their jobs and will be forced to illegally emigrate to the United States, where they are treated as fifth-class citizens. Ortega affirmed that his party, the Sandinista National Liberation Front (FSLN), was never in agreement with the FTA. Meanwhile, the United States is continuing its dirty war against the political process led by the former FSLN commander. According to the president’s recent condemnations at the Sao Paulo Forum – held in Managua – the administration of George W. Bush is working “behind the scenes” in order to boycott the social and economic programs embarked on by his government, which have seen significant advances to date in spite of obstacles laid out by their enemies. In a firm but conciliatory tone, Ortega referred to the fact that, despite the ideological differences between the two governments, relations between the United States and Nicaragua should be based on mutual respect and for that reason, he said, the underhand campaigns it is financing with the domestic right and with the privately-owned media are unacceptable. For the president, Washington’s interference in the internal affairs of his country are aimed at supporting groups calling themselves “representatives of the population,” when in reality these were destroyed by voters in last year’s general elections. It is believed that a new split in bilateral relations could show itself after the Managua government confirmed an embargo of assets owned by U.S. oil company Esso in a tax payment dispute. The fraud on the part of the company consisted of declaring certain quantities while in the customs report, others appeared, according to presidential advisor Bayardo Arce. The plan executed by Washington against Managua since Ortega assumed power is not that different from those that the White House – whose tenant Bush is currently rejected by 66% of his own people – has traditionally employed against legitimately constituted governments in Latin America and the Caribbean. Remember Haiti, Chile and Guatemala. The only difference is that we are in different times now and the governments have the support of powerful social and indigenous movements with a high level of political awareness. What the right wing is looking to do now is to confuse the Nicaraguan population with tall stories in order to boycott the political and social programs of the administration of Ortega, the man who led the country from 1985 to1990, but did not secure reelection because of interference by the United States, which was supporting the so-called Contra war. 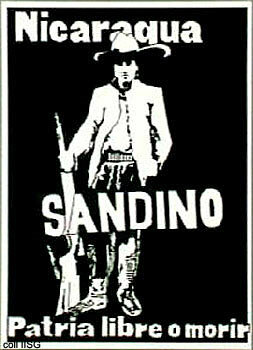 This entry was posted in Armed Struggle, Bolivia, Capitalism & Bourgeois Liberalism, Capitalist Exploitation, Capitalist Repression, Capitalist Restoration and Counterrevolution, CIA Atrocities, Cuba, Fascist Massacres, FBI and CIA, Honduras, Imperialism & Colonialism, Internationalism, Latin American Liberation, National Liberation, Nicaragua, North America, Reactionary Watch, Sandinista National Liberation Front, U.S. Imperialism, United States, Venezuela. Bookmark the permalink.